Motorists on Interstate 77, a major north/south highway, pass easily and quickly through the Big Walker Mountain Tunnel near Wytheville, Virginia, and East River Mountain Tunnel at Bluefield, West Virginia. 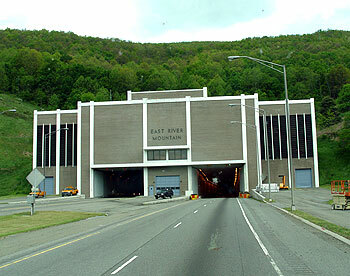 The twin lane East River Mountain Tunnel is 5,400 feet long and the Big Walker Mountain Tunnel, also twin lanes, is more than 4,200 feet in length. Changing lanes is permitted in both tunnels. Travel, however, was not always so easy between the two states. Travel to the other side of Big Walker meant traveling the twisted, however scenic, Highway 52. On East River Mountain, travelers actually crossed over the mountain on a narrow road. Like many mountain roads, fog and winter snow sometimes contributed to the roads having to be closed. Elevation for both mountains is more than 3,000 feet. The logical solution was a tunnel through both mountains. Construction of the Big Walker Tunnel and adjacent roadways took five years. It was opened in 1972 at the cost of $50,000,000. It made history at that time as the most expensive single project undertaken on a Virginia interstate system. Groundbreaking for the East River Tunnel took place in 1969. The tunnel was completed in 1974 and at $40,000,000 carried the biggest price tag of any project done to date by the West Virginia Department of Highways. Because the tunnel connected the two states with the state line dividing nearly half the tunnel, Virginia shared in the expense. 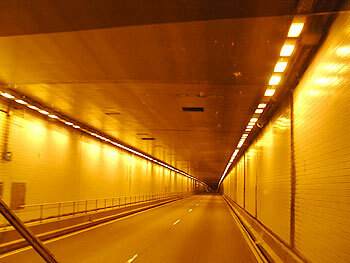 Inside of East River Mountain Tunnel. The work was difficult, the TNT explosions were loud and the mud was deep. At East River Mountain, caves created sinkholes and sunk part of the tunnel two feet so that concrete had to be hauled in to correct the problem. More than 30,000 feet of lumber was also hauled in to support the tunnel. Today thousands of motorists enjoy the safe drive through the tunnels. Closures for repairs in the tunnels are in 15-minute intervals to perform maintenance, air quality testing, as well as fire and safety upgrades to the ventilation system. Automatic sensing analyzes the amount of carbon monoxide and adjusts the ventilation system. Generators back up the power in case of a power failure. Traffic lights can slow or stop the traffic in case of accidents, and fire extinguishers and telephones are available inside the tunnels. Although driving Highway 52 and climbing to a mountaintop brings scenic and exciting adventures, motorists on a time schedule enjoy the fruits of so many workers' labors by traveling through the Big Walker and the East River Mountain Tunnels.